Alignment is arguably the most important thing in golf. You will use golf alignment techniques each and every time you address the ball. So, always look for ways to "zero" your alignment. This is why you address the golf ball the same way each time. Addressing the golf ball effectively taps into your understanding of golf fundamentals, such as grip, balance, and swinging the golf club down the target line. When you are sure you can get the ball to go exactly where you are looking, you will have the confidence to try and make the shot. Until then, take the safe shot. Your swing path determines whether or not you are able to get the ball to your target. This is a very critical part of golf alignment. You must start the ball in this swing path direction to get it to the destination. Remember the longer you can keep the club down the target line, the better the ball's chance of reaching its goal. To align to a target, you must stand behind your ball some three to five feet. Stand so that your ball is between you and your target or where you want the ball to go. Once you have picked a suitable target, slowly look from your target to the golf ball and find a spot on the same line near the golf ball. Now when you address the golf ball use the spot you found nearer the ball. This is your intermediate alignment point. Practice this! 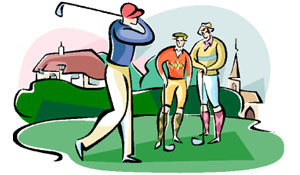 Now, the very first thing you must do to hit a golf ball where you are looking is to properly grip the golf club. To do this, right-handed players must stand with the left foot forward. Then align the golf club with the left hand, so that the grooves or lines are parallel to your left foot; do this while holding the golf club with the left hand. The grip you take now will be aligned to the position of your feet. Where they line up is where you are aimed. Next, address the ball with your right foot and align the club head to your target. Keep your right foot square to the target and aligned with the club face. Now step up to the line with your left foot. Again, this is for right-handed players. You should be on a parallel line adjacent to the target line. Is that where you want the ball to go? If not, make the correction. Your swing path must be down the line of your feet. Think about it. From the tee, plan a shot that will take fairway trouble out of play. For example, hit irons short of bunkers, or hit 3w over bunker. Of course this would mean knowing how far you are able to carry your iron shots as well as your 3-wood. Carry distance is how far the ball travels in the air. Here is a simple tip for achieving and improving golf alignment. Just remember "ABS" as in address, ball position, swing. These are the three keys to mastering golf alignment. You will be surprised how well these few basic fundamentals show you where you really need practice. But until you get consistent doing these things you may never see your real swing. Look up details of The ABS Method.